Set on the pristine sands of Bávaro Beach along the clear, calm waters of the Caribbean Sea lies the 24-hour all-inclusive Barceló Bávaro Palace – part of the Barceló Bávaro Grand Resort. This resort offers the ideal setting for a couples getaway, family vacation, destination wedding or large meeting. Guests can enjoy up to 11 restaurants with amazing culinary variety, four swimming pools including a children's water park, a 24-hour casino, a theater, the state-of-the-art U-Spa, bowling, a world-class convention center, The Lakes Barceló Golf Course, soccer and baseball fields, and more. For those seeking an elevated experience, Premium Level accommodations offer the best views, unlimited access to specialty restaurants, 24-hour room service, private check-in, and personalized concierge service. The Family Club offers two bedroom accommodations, a special mini-bar for families, exclusive check-in, and concierge services. 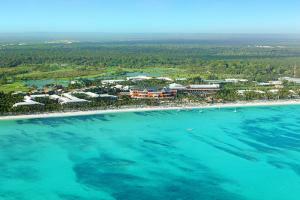 Located on the fine white sands of Bavaro Beach, and 20 minutes from the Punta Cana International Airport.